If you’re around horses or horse owners long enough, you’ll eventually hear someone say, “No hoof, no horse.” That simple statement summarizes the importance of the hoof to the horse’s overall well-being. The horse hoof is strong, but problems commonly occur. Causes abound: A conformation defect putting undue strain on a portion of the hoof, an injury such as sharp object penetrating through the hoof, and environmental factors such as extremely moist conditions are common ones. Proper care and maintenance greatly reduces hoof diseases and problems in horses. If your horse suddenly appears three-legged lame with no apparent or visible injury, suspect an abscess. Dirt or bacteria entering an opening in the hoof can cause an abscess. A hoof abscess can cause swelling and a stronger pulse in the lower leg, but the best way to diagnose an abscess is for a veterinarian or a farrier -- a professional who trims and shoes horses -- to test for sensitivity on the bottom of the foot. Once he has pinpointed an abscess location, he may scrape away a portion of the hoof to drain it, after which the horse typically feels better quickly. 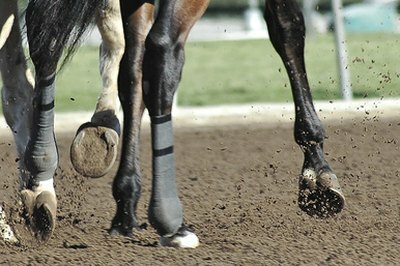 Some horses have thinner soles than others, either naturally or through improper hoof care. Since the sole protects the coffin bone, which fits within a hoof capsule made up of the wall, sole and hoof frog, a thin sole can actually cause bruising or more severe damage to the coffin bone. Shoe and trim thin-soled horses carefully to avoid removing excess sole with each trimming. Adding a pad or gel between the sole and shoe can protect the sole and prevent injury to the hoof and coffin bone. Clean hooves daily to remove rocks that can contribute to pain and possible bruising. Thrush is a common hoof problem whose likelihood of occurring you can minimize by keeping your horse's living environment and his hooves clean. If your horse gets thrush, you will usually know it when you clean out his foot by the smell, indicating bacteria has entered the grooves of the hoof frog and become infected. Also look for a black discharge. To treat thrush, keep the foot dry and clean, and buy a prepared thrush treatment; you can get it without a veterinarian’s prescription from horse supply stores. Left untreated, thrush can cause hoof damage and lameness. Call your vet if lameness has already set in. If you see a separation in the hoof wall, ask your farrier or vet to check for white line disease. Sometimes bacteria and fungi can get inside the wall, causing it to turn white and crumble. Left untreated, white line can cause temporary or permanent lameness as the infection continues to eat away more of the hoof. You may be able to treat minor cases with a topical treatment if you catch them early. Your vet or farrier will cut away the infected portion; in severe cases, you can't ride or turn out your horse until it grows back. Going too long without proper trimming can be a contributing factor, increasing the likelihood of bacteria getting inside a weaker, crumbling hoof wall.